Spectacular houses deserve front doors designed and built to reflect the technical advances in secure access control - without compromising on style. Our secure Uber front doors offer state of the art fingerprint scanning, or keypad entry as well as the most secure key activated 5-point locking systems available. You’ll also be able to personalise the design of your installation by specifying the dimensions, shade, hardware and accessories you need so suit your home in London. Configure the door to meet your design perfectly, by choosing size, colour inside and out, cladding material, hardware,and integrated LED lighting in the doors and handles. Inside and outside, your Uber front door will blend in seamlessly. The market-leading features included with your product will make your home thermally efficient and safer. Your home in London will also have better market appeal – making it easier to sell if and when you decide to move. Talk to the Finepoint team today. The entrance to your property is the first thing a visitor will see. Whether you’re entertaining family or friends, you’ll want to create the best first impression. Uber front doors are the pinnacle of luxury and will be sure to catch the attention of anyone stepping over your threshold. We cover London and the rest of the UK too – so get in touch today. Personalise the appearance of your new Uber front door by specifying its dimension and selecting a style that’s either ornamental or decorative. Should you want to achieve a solid look without glass to preserve your privacy, we can help. Equally, if you want to let lots of light into your property, elegant glasswork can be included. The choice is yours entirely. In terms of materials, you’ll also have the opportunity to choose. You can include high-grade aluminium warm or traditional wood in your design – or, if you prefer, both. Whatever type of property you live in – whether in London or elsewhere in the UK – we’ll be able to tailor the appearance and performance of your product to suit your requirements fully. With up to five thicknesses of glazing, sizes up to 3m high,and clad in Aluminium, Timber or Glass, you can give a unique finishing touch to your residential exterior. Your Uber front door can be as unique as you, so let your imagination run wild! Create a residential door like no other when you choose Finepoint Glass as your installer, while also enjoying all of the following benefits. The customers we work with – in London and UK-wide – list thermal efficiency as one of their top priorities. Uber front doors are built with comfort in mind, so you won’t need to compromise when you choose us your installer. Our doors are super-insulated, weatherproof and capable of achieving an overall U-value of 0.54, which exceeds recommendations made by Building Regulations and Passivhaus. Take a closer look at any of our Uber front doors and you’ll soon realise why its won so many accolades. 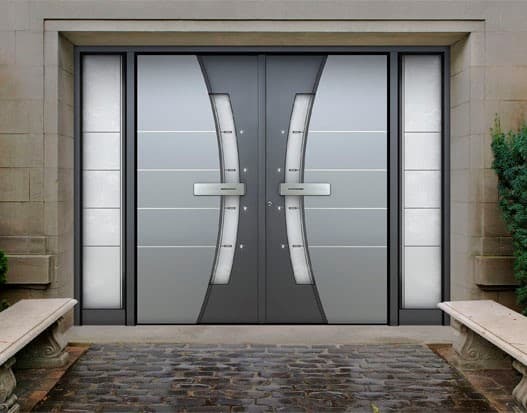 Features like concealed handles, LED illumination to make entering or leaving your home at night safer, and fingerprint reading technology make our doors stand out head and shoulders above the competition. Choose innovation and style for your home. Contact the Finepoint team for further advice. Don’t be deceived by the appearance of your new Uber front door. Although incredibly stylish, it possesses incredible durability and includes cutting-edge security technology as standard. Your new entrance door will resist hard impacts and attempts by unauthorised guests to gain entry to your property. Find out why our Uber front doors are so popular with our customers in London and UK-wide. Are you keen to find out more about our doors? Make an appointment online today to come and see us in our London showroom. To see our Uber front doors – and other products – in close up, you can visit our dedicated showroom in London. If you live elsewhere in the UK, and don’t want to travel, take our Virtual Tour to learn more. Click on hotspots within each image to learn more about it, then contact us directly with any questions or to get a free quote. Finepoint Glass has extensive experience of helping customers in London and the rest of the UK with their design projects. We work with homeowners and commercial clients to deliver unusual and impactful solutions that add value. Whether you’re interested in our Uber front doors, or have more wide ranging needs, contact us today.